At some point during your travels in Nice, France you should make time to visit the markets. Two of the most popular markets are Cours Saleya Flower Market & Liberation Market Nice. Most visitors will end up in Old Town or Vieux Nice, but that’s not the only place to shop. Niçoise markets are colorful and lively, and shouldn’t be missed while on the Côte d’Azur. Shop with the locals at the largest fresh market in Nice! This hidden gem is off the beaten tourist route, but well worth the visit, especially on the weekends when the market is overflowing with vendors. Everyone seems to know each other, stopping in the streets for a quick chat before strolling off to bump into another friend or neighbor. I overheard an animated conversation between a woman and one of the vendors as he explained to her the best way to choose citron or lemons. I loved how, even though the vendor was busy, he took the time to help the woman pick just the right lemons instead of just throwing a few in a bag and moving her along, my, up to now, preferred method! At the Liberation Market you will hear almost exclusively French, but don’t let that deter you. Shopping with the locals is the best way to experience the real Niçoise way of life. Here you can buy fresh fruits, vegetables, cheese, fish and more at great prices from local producers. These prices can be up to 50% less than at the more touristy markets. There are even organic (bio) vendors at this market, for those concerned with finding organic goods while in Nice. In addition to the open market, you’ll find a small covered market called Cite marchande docks de la Riviera which houses meat, cheese and bread vendors. The Liberation area is mix of upscale stores and traditional shops. Stop for a coffee or grab lunch after you’ve spent time meandering through the market stalls. Admire the beautiful architecture and the newly renovated railway station now turned into a media center or médiathèque. If you’re looking for places to eat in the area, you can try La Casa di Giorgio which has the same owner as the great Italian shop, L’Altra Casa, just down the street. L’Altra Casa serves Italian meats and cheeses as well as coffee and sandwiches. I’m looking forward to going back to try the stracchino cheese! Next time I head to the market, I’m also hoping to finally try La Socca Tram chez Silvan for socca and Kiosque chez Tintin which is supposed to have the best Pan Bagnat, a sandwich filled with classic Salade Niçoise. If you’re looking for organic bread, you can head to Mama Baker on Rue Lepante, a short distance away, or enjoy a meal made only from products of small, local producers at Comptoir des Terroirs. I hear their Sunday brunch is awesome! You could also have coffee at Le Comptoir de l’imaginaire (Café 3D), a cafe with a 3D printer that is sure to delight both adults and kids alike. Before heading back to the Old Town, stop at the Notre Dame on Rue d’Italie, then wander down to Rue Vermier. Here you will find lovely shops and restaurants, many focusing on fair-trade and community involvement. Visit the children’s book store Les Mots du Monde and shop for fair-trade products at Artisans du Monde. Lunch at Circuit Court is also a great option, serving delicious, organic, seasonal and local foods. Each day you can choose from an affordable menu of 3 freshly made dishes. I enjoyed a fabulous broccoli quiche with salad followed with a dessert sampler and fair trade coffee. If you’re looking to eat healthy in Nice without breaking the bank, you definitely need to try Court Circuit! Don’t forget to make a reservation for lunch. I was definitely full after lunch, but I didn’t feel overfull or tired. It makes such a difference when you’re body is happy with what you have eaten and putting the nutrients you’ve consumed to good use! The market just opened and we beat the crowds. Olive oil and Vinegars make great gifts. Soaps – another gift idea. We live the lemon. It’s orange season here in Nice. The Cours Saleya Market is located in the heart of Old Town. This is a must see when visiting Nice! Head here in the morning or early afternoon to pick up fresh fruits, vegetables and local goods. This is the perfect time to grab local veggies for your evening dinner or fruits to take on an afternoon picnic. You’ll also find a variety of olives, meats, cheeses, oils, herbs, handmade soaps, Provençal gifts and more. Please note that this is a market not to be missed, but is more touristy than Liberation as it’s in Old Town Nice. Prices can be a bit higher as well, but the products are just as tasty and it can be super convenient when visiting the city. After the fresh market pack’s up for the day around 1pm, the space becomes seating areas for the restaurants. Who wants a fruit tree? The Cours Saleya flower market is located just at the west end of Cours Saleya, near Rue Saint-François de Paule. Stroll under the striped awnings while taking in the beautiful colors of the sweet smelling bouquets. It’s also fun to see the small lemon and orange tress for sale. This is not something we see in my home state of Virginia! Get your fresh fish right in Old Town. The market is fairly small, but you are sure to find something for the day’s meal. Kids will get a kick out of checking out the more unusual fish and octopus and watching the seagulls flying around. At this secondhand market you’ll find knick-knacks, furniture, paints, jewelry, clothing and more. It’s fun to wander the market and hunt for treasures. Derrick purchased a door knob from the famous Hotel Negresco that we plan to use when we move back to the states. You’ll also find a secondhand market at Place Garibaldi on the 3rd Saturday of every the month. 1st and 3rd Saturdays of each month from 7am – 5pm in winter and 7am – 7pm in summer. Outside the Place du Palais de Justice you can find a great market to purchase books, old postcards and photographs . We purchased a few postcards of Nice from the 1920’s and plan to take photos of present day Nice to frame side by side. Lucy picked up a copy of Bambi (in French) to practice her reading. 2nd Saturday of the month from 7am to 5pm in winter and 7am to 7pm in summer. Also at the Place du Palais de Justice, you’ll find a quaint artisans market, once per month. If you happen to be visiting Nice at this time, it’s great to walk around admiring the art. You may even find something to take home to remind you of your trip! Note – In winter things tend to get started a little later, with most vendors not setting up until around 8am. Now that you know when and where to find the fresh markets in Nice, France – you need to learn how to shop at them. Bring cash – You need to bring euros with you when shopping at the fresh markets. Exact change is preferred, but you’ll be fine if you have small bills and coins. Keep those 20€ and 50€ bills for the restaurants and stores. Pick the stand crowded with locals – you know it’s a great spot when the locals are crowded around speaking rapid French with the proprietor. The locals know which stands are the best, so don’t shy away from the busy ones. Buy in season – just as you should at home to save money and get the freshest fruits and vegetables. The same is true here in Nice. Strawberries in December will be imported and super expensive while you can get sweet oranges for a low price picked right down the road. Winter is the time for root vegetables, cabbage, cauliflower, pumpkins, radish, limes and oranges. Summer is time for strawberries, tomatoes, artichokes, leeks, peppers, zucchini, cucumber, peaches, melons and a large selection of lettuces. To pick the freshest vegetables, always look at the leaves and inside products such as broccoli. Look for smaller vendors – If you notice vendors with everything under the sun, they are likely importing their goods from other areas. Not that the products aren’t good, they just aren’t local and will have traveled farther. We like to stick with the vendors selling local goods which will mean a smaller selection. Take a lap around before buying – Check out the stands by taking a walk up one side then back the other. Take note of the products available and the prices. One stand may be selling the strawberries for 3€ per package while four stands down you’ll find berries looking just as good for only 2€ for the same size package. While this isn’t always the case, we tend to find the best prices at the far side of the market – on the opposite side of the flower market. Bring your own bag – Many vendors will be able to give you a bag called a sac in French, but it will make things easier to have your own. If purchasing salad, ask for a sac to load up all the loose lettuce leaves, then hand it to the proprietor for weighing. Always say “Bonjour” – When approaching a stand, always say Bonjour which means good day. You should also finish off your purchase with Merci, Au Revoir meaning thank you, good bye. The French are more polite than Americans and always start off a conversation with a greeting. It’s just good manners here. You need to learn these three words at the very minimum, even if you can’t understand any more French. Most vendors at Cours Saleya speak English so don’t be discouraged from purchasing at the market. If the vendor doesn’t speak English, pointing and smiling also works well enough. Get kids involved – To get kids excited about the market, ask them to pick out a fruit or vegetable to try. Kids will usually eat something they’ve picked for themselves. Ask for ideas on how to prepare the item or just let Google help you out. Shopping at the markets are a great way to experience the charm of Nice. Live like a local and people watch while getting the days fresh foods. 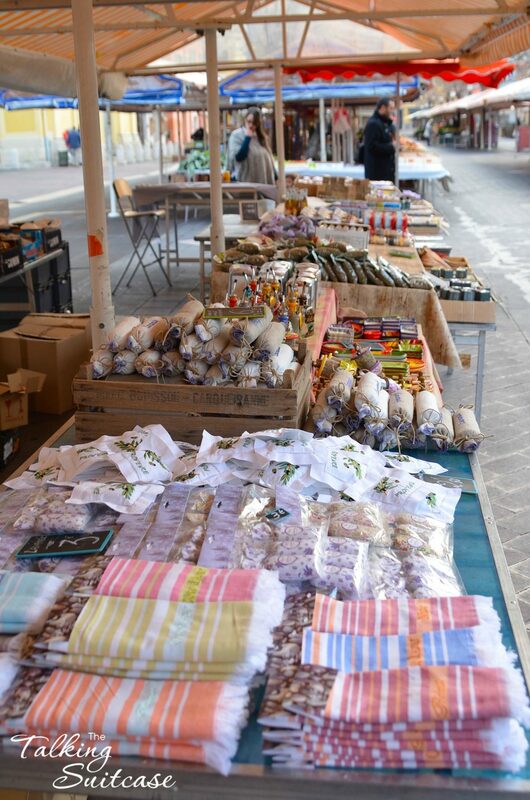 Market shopping is a must do when visiting Nice, so don’t miss out! The above are our favorite markets and our top recommendations when visiting Nice. See all the Markets in Nice by checking out the Tourist Office site. What are your tips for shopping at the Cours Saleya Flower Market, Fresh Market, Liberation Market or others? I found this cool cookbook The French Kitchen Cookbook: Recipes and Lessons from Paris and Provence for anyone wanting to try French recipes. We even tried a few of these at home before moving to France. Disclosure: I worked with the Nice Tourism Office to facilitate this article. All options are 100% my own and may differ from others. Great Article! thank you so much.. It will definitely be of great help. We are planning our honeymoon in November this year and this article has gotten us super excited. Nice article. I always love visiting the local market wherever you are. It really gets down to the heart of a culture through their food. Great photos! P.S. A used book market sounds perfect. Nothing better than a well-loved book, something about the smell, and they’re always cheaper :). All those fresh veggies! They look amazing! I love open markets, they’re so neat and fun. Love markets and we were just there in Coeurs Saleya last April 2014. Wish I could go back now and explore the others!!! Great article. I love visiting the markets when i’m in a new place. When we lived in India that is the only way to shop – the local markets on the side of the road. They definitely weren’t as nice as these though! beautiful photos! Is worth reading, explained very well. Last time in Nice I just passed through on my way to Italy. Now it’s nice to have more info about cool things to do there for my next trips. Wow this is great info! I wish I’d read something like this before I went to Nice. It was lovely and I really want to make it back there some day! I always visit the markets where ever we go. It’s a great way to see into local life (if you’re not in a touristy market) and learn about new foods and products you may never have seen before. It’s fun to walk around and see how things differ in other societies. The food looks amazing but what I really want to dig through is that used books market! Thanks for sharing. That dessert sampler at Circuit looks amazing! I’ve only ever been inside Nice’s train station (not the most exciting spot) so my memories of the city are grey, grey, grey. It’s great to see its more colourful side.